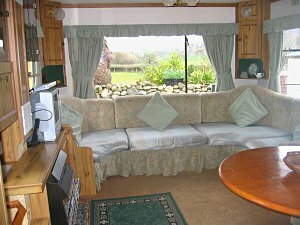 The caravan enjoys views of the surrounding hills and countryside. 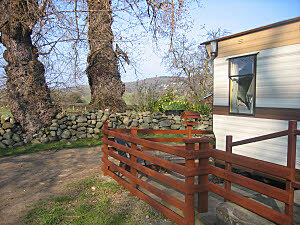 All weeks available at £260 Quality linen and gas and electricity included in price. 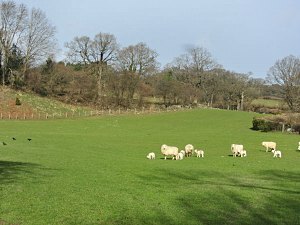 Nice open views of fields and animals. Plenty of parking space and safe area for children to play. 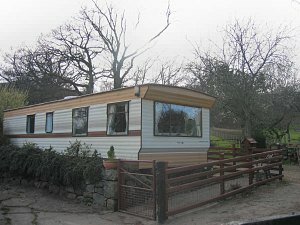 The caravan has 2 bedrooms - 1 double, and 1 twin bedroom. There is a comfortable lounge/diner with a seating area and table. There is a TV, video and DVD player. The kitchen is fully equipped with a microwave, gas cooker and fridge. 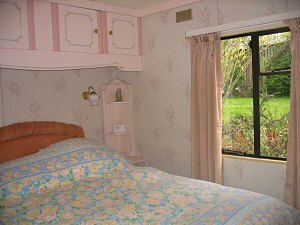 There are 2 bedrooms - 1 double and 1 twin bedroom. Bedlinen is provided. There is a bathroom with small bath, shower unit, basin and toilet. There is ample parking and visitors with children can enjoy a covered play area for young children with a wide selection of bikes, toys and games for children to enjoy. To help you enjoy the great outdoors there is a gas barbecue, and chimenea with wood provided.